Tritsimpida venue, a place of high quality standards that gives emphasis up to the slightest detail, offers the best choices for catering and menus. We are Greeks and that is why we love enjoying good, affluent and quality food. 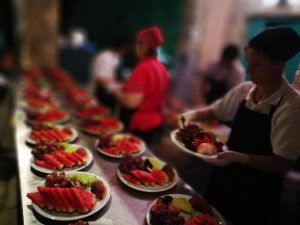 Having quality as our main priority we work with certain catering services, of honorable professionals of this industry, either from the prefecture of Ileia or from other areas, that respect the customer and their guests. Eparheion catering, with chef Nikos Apostolopoulos, who has many years of experience in a hotel resort of multicultural style, suggests many combinations for menus or buffets, depending on the preferences of your guests and on your own choices. The choice of the delicacies , that your guests will try, surely consists of a pleasant problem, that will largely define the success of the reception. This is the reason that as soon you book the date of the event, we arrange a meeting so as you can taste the menu with the people of whom you trust not only their opinion but also their taste in food. The chef will always be there, from day one, to solve any questions about the quantity of the food in each table, the way it will be served, the order each dish will be served, the flavor combinations and the selection of wine. The perfect equipment, the experienced staff, the high level of expertise and culinary art, as well as the flawless organization, all work for a spotless result.